We have enjoyed attending a couple of seminars while we were at the RVW rally on BLM Short Term Visitor Land in LaPaz. The first seminar was put on by Redlands Truck & RV. They are a family owned business, a brother and sister that have a large business that focuses on RV products that improve the handling, performance and safety of the RV. They have been in business for over 20 years. Many of the members of the RVW community have had done work by them. 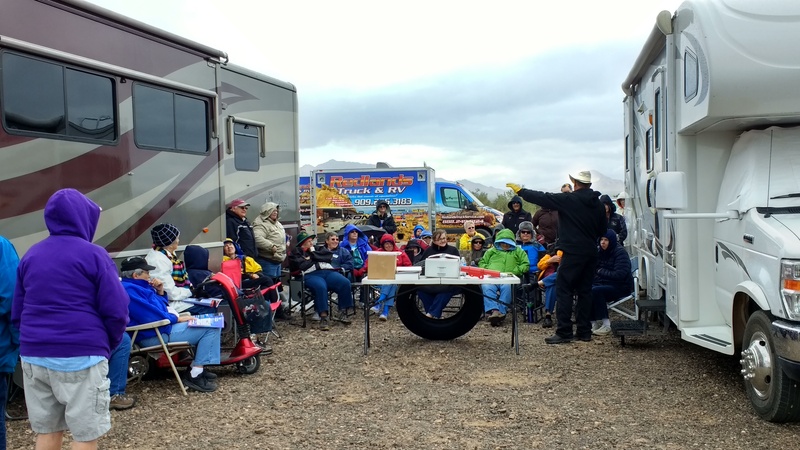 The talk ranged from discussions about tires, air vs. nitrogen, fill valves, steering and tracking, shocks, air filters, towing products and a little bit about solar. Redlands was also offering a free inspection of the underside of anyone’s rig that wanted it. We signed up and they looked under our rig and didn’t find anything that needed immediate repair with the exception of our generator exhaust pipe hanger bracket, which had come lose during the trip down. There is a front sway bar but no rear sway bar in this year E350. The tire date code indicates they are new and only a year old. We have a good K&N air filter which is something that they recommend for RVs. Most of us never think much about these things, but when you are driving a vehicle that weighs over 5 tons down the road, it handles much different than your everyday car. A bumpy road that you can tolerate with your car can be downright dangerous in your motorhome or truck and trailer as you can sway and get side to side motion. On our trip down to Arizona we felt like we needed new shocks, and especially noticed it the day the winds were so strong. We talked to the owner of the company, Keith, and asked some questions about the shock product they were recommending and selling. The shocks can improve the ride of motorhomes up to 80%. It also does not increase the height – something very important to us, as we need to park our rig in our garage in our neighborhood and only have a couple of inches to spare! We have decided to proceed with getting the 4 Koni shocks installed. He suggested Koni shocks as the first upgrade and a rear sway bar as the second upgrade. We are going to get them done one at at time – if we get enough improvement with the front shocks we will not go ahead with the rear sway bar. Redlands actually has a temporary shop set up here at Quartzsite RV Show so we have an appointment to get it done. The other big discussion was on air vs. nitrogen for tires. Nitrogen loses less than one pound per year per tire and is what all the tire manufacturers are recommending. It has no contaminants in it – such as water or oil. The molecules are bigger and can’t leak out the side wall of the tire like air can. Nitrogen can extend the life of a tire – perhaps up to 10 years for a tire. For dually tires, Redlands also recommends replacing the flexible extension valve stems with a one piece valve stem so that no leaks can occur. Most failures on duallys occur due to faulty valve stem extenders according to them. If you don’t use nitrogen, then you should check tire pressure often and perhaps consider using a Tire Pressure Monitoring System (TPMS) by TST. TST is the only brand that you can replace the batteries in the valve cap, all other brands you have to throw the sensor away and buy a new one if the battery goes bad. If you use nitrogen, you don’t need to purchase the flow through sensors, if you use air, you should purchase the flow through sensors so you can add air to the tires. I was happy to hear that Keith told everyone that if you use air in your RV tires, you can’t use a cheap air compressor and expect that it will inflate the tires to the pressures we need in the RV tires. He recommended the Vi-Air RV Compressor that we purchased prior to our trip. Redlands hosted a barbeque at their Quartzsite shop for new and current customers Sunday night. A few of us went in for some good food. They had a couple performing on guitar and keyboard playing some good country music, free appetizers and drinks, excellent barbeque and a good time was had by all. The weather has continued to be atypical for Quartzsite this time of year – the wind and rain have still been coming down here at Quartzsite. There have been some flash flood warnings for the washes in the deserts. Our next seminar was about solar and much of the discussion was about battery maintenance. We don’t have any solar on our rig but if we get into doing much of this boondocking, it will be something we seriously look into. There are many ways to go about solar – from portable suitcase panels that you put out when you get to camp and then panels that are mounted on the RV roof. Some are mounted flat and can’t be adjusted. Some are mounted flat and someone climbs the ladder and angles them. Then there are flat mounted ones that can be raised with a button from inside. The charging systems range from 6 volt to 12 volt. 6 volt is better because the plates are thicker and the batteries are not made for as many cranking amps as a 12 volt. They are higher and larger than a 12 volt battery though and that causes problems for space in some RVs. There was a lot of discussion of the maintenance of the water level of the battery and exactly where the water should be. Many people fill the water too full, or they don’t fill it at all. The controllers are another area as well – they allow you to monitor how much energy you have stored and are using. The gentleman that was giving the seminar actually sold a few devices to help monitor and water batteries correctly. When you are living in your RV for a few months like we are, the power grid is your responsibility. We were happy to have the opportunity to hear from some experts and learn about all of these things. Our rig is the second from the right! What great way to end the day – a beautiful sunset! 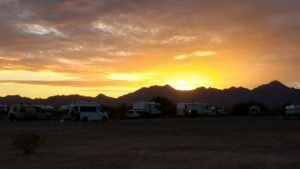 This entry was posted in Arizona, Uncategorized and tagged Boondocking, Redlands. Bookmark the permalink. 5 Responses to Learning and Living! Good information. Prudent upgrades to your RV. Glad to hear you two are having fun and meeting new RVers! Seems like most campers you meet are good people, I have only found a handful of bad ones! The seminars sound awesome! Thanks for all the tips! Yes we are having a great time and meeting some really nice people. You know that we’d do anything for you Todd, including picking you up at whatever airport you land at. It may be tight quarters, but we can make it work! Guess what? We are living the dream! Goodness! It’s like work! Staying active and looks like your relishing life on your own terms!! Thanks for the info and the stories of your day!! Yes, all good stuff we need to know. Glad you’re enjoying our stories.